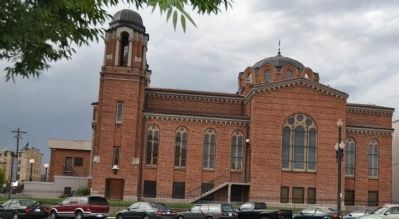 The Holy Trinity Greek Orthodox Church is evidence of the size and religious devotion of Salt Lake City's Greek immigrant community. In the early 20th century, Greeks were the largest immigrant group in Utah. 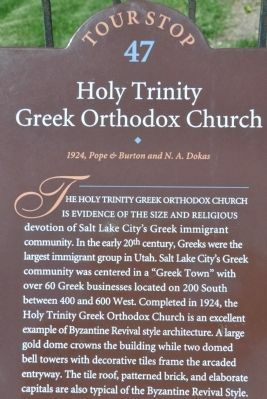 Salt Lake City's Greek community was centered in a "Greek Town" with over 60 Greek businesses located on 200 South between 400 and 600 West. 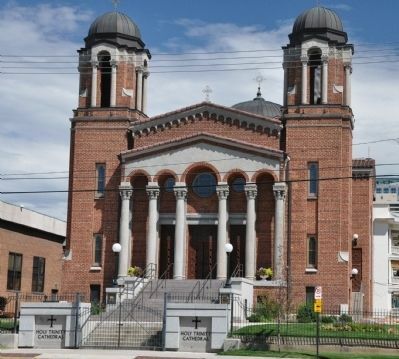 Completed in 1924, the Holy Trinity Greek Orthodox Church is an excellent example of Byzantine Revival style architecture. A large gold dome crowns the building while two domed bell towers with decorative tiles frame the arcaded entryway. The tile roof, patterned brick, and elaborate capitals are also typical of the Byzantine Revival Style. Cathedral grounds fence. Marker is at or near this postal address: 279 South 300 West, Salt Lake City UT 84101, United States of America. Touch for directions. Other nearby markers. At least 8 other markers are within walking distance of this marker. A different marker also named Holy Trinity Greek Orthodox Church (a few steps from this marker); a different marker also named Holy Trinity Greek Orthodox Church (a few steps from this marker); Broadway Hotel (about 500 feet away, measured in a direct line); The Flag of the United States of America (about 500 feet away); Utah's First Pioneer Burial Site (about 700 feet away); Utah's First Fort (about 700 feet away); Park (Rio Grande) Hotel (approx. ¼ mile away); Salt Lake City High School (approx. ¼ mile away). Touch for a list and map of all markers in Salt Lake City. More about this marker. This is Tour Stop 47 on the Utah Heritage Foundation's Downtown Walking Tour. More. Search the internet for Holy Trinity Greek Orthodox Church. Credits. This page was last revised on June 16, 2016. This page originally submitted on September 4, 2010, by Bryan R. Bauer of Kearns, Ut 84118. This page has been viewed 788 times since then and 6 times this year. Last updated on September 14, 2010, by Bryan R. Bauer of Kearns, Ut 84118. Photos: 1, 2, 3. submitted on September 4, 2010, by Bryan R. Bauer of Kearns, Ut 84118. • Kevin W. was the editor who published this page.